Data source: National Fire Agency, Ministry of the Interior, Taiwan. 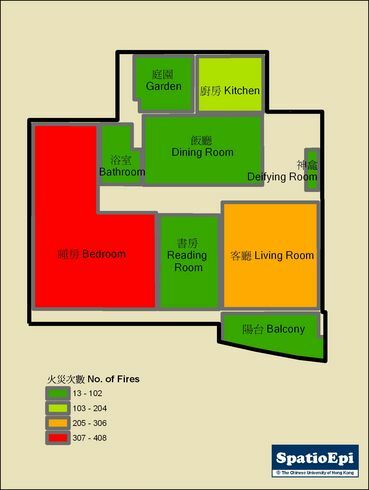 This is a floor plan showing the number of fires occurring at different locations within households in Taiwan during the year of 2008. The number of fires is presented in graduated colour, from green (lowest) to red (highest). This “map” imitates the general house plan in Taiwan. The highest number of fires occurred in bedroom (408 cases), followed by living-room (218 cases), and kitchen (181 cases). The bedroom fires might be due to cigarette smoking in bed, which is a common cause of household fire. While similar statistics are not available in Hong Kong, household fires can be an area of concern, though the causes could be different. In 2008 there were 1589 fire cases in public housing estates and 1601 in other residential buildings in Hong Kong. Overall, 4 cases were classified as major fire (Number three alarm and above). According to the Fire Services Department, Hong Kong Special Administrative Region Government, careless handling or disposal of cigarette ends, matches and candles are the major causes of fires, followed by accidents involving the preparation of foodstuff and electrical faults. In 2008, fires claimed 10 lives and resulted in 397 injuries. The Fire Services Department handles not only fire-fighting, but runs ambulance services, as well as other special services such as traffic and industrial accidents, gas leakages, landslides, flooding, house collapses, suicidal attempts from height, malfunctioning lifts.